​Additions and substitutions subject to charge. Two eggs* any style, with crispy hash browns and your choice of toasted fresh bread. Add all natural sausage, ham, bacon, or chorizo. Two whole wheat sourdough flapjacks, two eggs* any style, with bacon. Served with 100% pure New England maple syrup. Add blueberries, granola, or chocolate chips. Two eggs* any style atop hash browns and melted cheddar cheese, topped with house green chile and bacon. Two eggs* any style, over hash browns, smothered in sautéed fresh spinach, red onions, tomatoes, and garlic. Topped with Parmesan. Served with toast. Fritatta style scrambled eggs with fresh sautéed vegetables and potatoes. Topped with melted provolone and avocado. Served with homemade salsa and toast. Two eggs* any style over hash browns with raw carrot, avocado, sprouts, tomato and cucumber, in a flour tortilla. Served with creamy citrus or house dressing. Made fresh daily. Choose from meat or vegetarian options. Served with seasonal fresh fruit. Two scrambled egg, with bacon, ham, sausage or chorizo. Topped with melted cheddar cheese. Served on our toasted, fresh bread. Two scrambled eggs, with avocado and sliced tomato. Topped with melted jack cheese. Two fried eggs* with lettuce, tomato, and bacon on your choice of grilled, fresh bread. ​Baked in house with organic steel cut oats, organic sesame and sunflower seeds. Maple Pecan or Sugar Free Date and Oat. Add seasonal fruit or yogurt. With soy, rice, or almond milk. Half orders available. Organic, steel-cut oats, cooked to order, served with hot milk. Add raisins, maple syrup, or granola. Add seasonal fruit or yogurt. Half orders available. Freshly baked, organic bread of your choice in our vanilla cinnamon custard. Served with 100% pure New England maple syrup. Whole wheat, house sourdough flapjacks served with 100% pure New England maple syrup. ​ Add blueberries, granola, or chocolate chips. 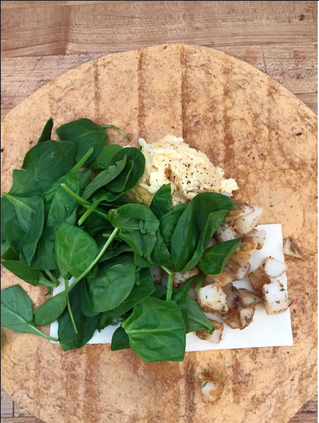 Three eggs folded gently over a variety of savory fillings. Served with toast. ASJ - Avocado, house made salsa, and jack cheese. Southwest - Chorizo and jack cheese, topped with house green chile. Ham and Swiss - Ham and Swiss cheese. Locally-grown black beans cooked with special house spices, potatoes, onions, and red bell peppers. Wrapped in a red chile tortilla, topped with your choice of house red or green chile, shredded lettuce, tomato and red onion. Add egg, cheese or Xmas. Add avocado. Add chorizo. Cheddar and jack cheeses melted in a crispy red chile tortilla, with house red and green chile sauces. Served with salsa upon request. Add sour cream or egg*. Add avocado. Add chorizo. Add jalapeños. Two eggs* any style over our house black bean mix, with avocado and cheddar cheese. ​Served between corn tortillas, topped with house red or green chile, shredded lettuce, tomato and red onion. Limited quantities. First come first served. Our tasty house gravy loaded with all-natural Gosar Farm sausage. Served over two freshly baked, hand-cut biscuits. ​ Add two eggs*. Top with hash browns. ​Two poached eggs* on a house English muffin, topped with hand-whipped, house Hollandaise sauce. Served with a side of O'Brien potatoes. ​ Sauteed spinach and ham. Avocado, tomato, and shaved bacon. * Eating undercooked/ over-easy eggs increases your chances of contracting a food-borne illness. A GIANT tortilla filled with cheese, spiced potato, scrambled eggs, and a variety of fillings. Add house green or red chile, sour cream, or salsa! - 1.00 each. Hot, fresh, ready to travel. with crispy hash browns. smothered in red or green chile.